The Tom Clancy’s The Division 2 Private Beta starts in less than 12 hours and introduces players to the open world of Washington D.C. and a variety of new activities and unique features of the game for the first time. 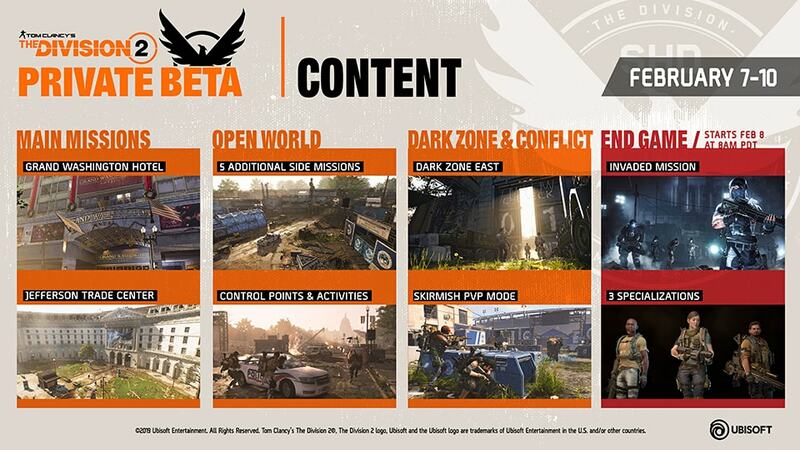 The beta content includes main- and side missions, access to one of the three Dark Zones, the dedicated Skirmish PvP mode, and a sneak peek at the end game of The Division 2. Your first task will be to create a character by choosing between random appearance presets to start the journey. The maximum character level is capped at seven during the beta, while the full game will also provide numerous options to fully customize your characters’ appearance. To get a first glimpse of what awaits us in the final game, two main missions, namely Grand Washington Hotel and Jefferson Trade Center, are also playable in this beta and are available once the Base of Operations has been reclaimed. Dark Zone East—the largest of all three Dark Zones. Last but not least, the new Control Points mechanic and other living world activities will be part of it, so will be Conflict, an organized 4vs4 Team Deathmatch mode in Skirmish. 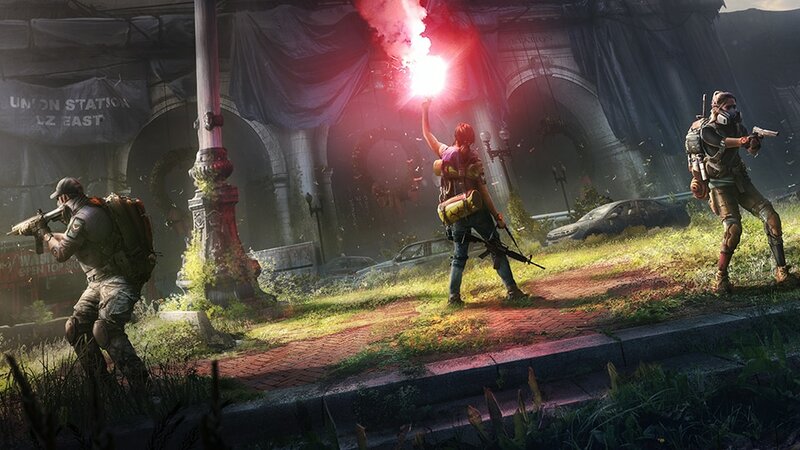 Although only one character can be created, three more – at level 30 and maxed out – characters will be unlocked throughout the beta phase (starting on February 8 at 5 PM CET) by completing the Jefferson Trade Center mission in order to try out the 3 different Specializations, and an Invaded Mission, one of The Division 2’s end game activities. If you don’t have access yet, you can still pre-order or register for a chance to be selected! 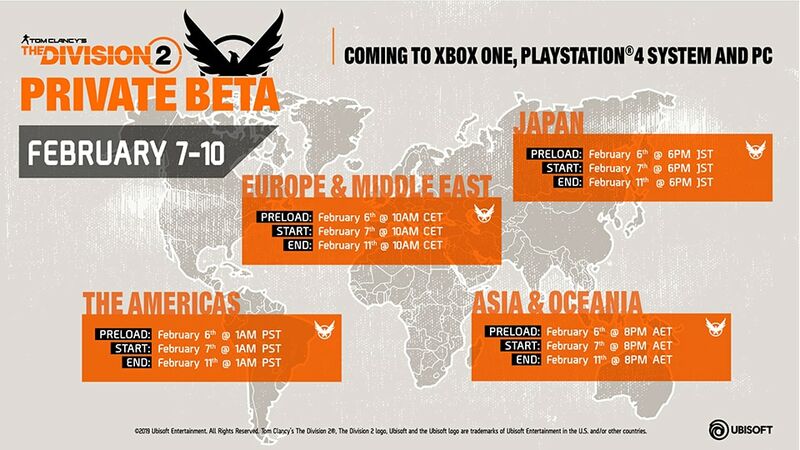 You can invite up to 3 friends to participate in the beta. This beta phase is not under an NDA (screenshots, videos, and experiences can be shared). Feedback can be provided in the official forums.